YANGON — One year ago today, more than two million Yangon commuters excitedly welcomed a major overhaul of the city bus system, which had become notorious for its worn-out fleets, unruly drivers, and conductors known for aggressively confronting passengers who dared complain about poor services. Then came the Yangon Bus Service, mostly known by its acronym YBS, an attempt by Yangon Chief Minister U Phyo Min Thein to replace the former capital’s old bus service—the Rangoon Motor Vehicles Supervisory Committee, also known as Ma Hta Tha. On the launch day of the new bus system, Jan. 16, commuters who had grown weary of Ma Hta Tha’s poor services had high hopes for the YBS despite an insufficient number of buses traversing the routes, resulting in overcrowding at bus stops, as some buses scheduled to start on the first day of the service were not ready due to poor planning. Volunteers stationed themselves at bus stops to introduce commuters to new bus lines and their routes while car-owning well-wishers offered free rides to help tackle the shortage of buses. The Yangon regional government seems committed to making the YBS a success. It placed the new bus system under the Yangon Region Transport Authority (YRTA) — an umbrella supervisory body for all types of transportation in the city — and invested 70 billion kyats via two public companies: Yangon Bus Public Co., Ltd (YBPC) and Yangon Urban Public Transport Co., Ltd (YUPT). YBPC used a large portion of the money to order 1,000 new city buses for US$56 million from China last year.U Zaw Zaw of Max Myanmar and Omni Focus company run by a grandson of former dictator Ne Win have bought another 1,000 new city buses. Now, 12 months later, some of the newly imported yellow and red city buses are plying the busy roads of Yangon along with buses from other private operators. “Commuters have more convenience than before as there are new vehicles on the roads,“ said Ko Tayoke Lay of Power Eleven, a private company that runs four bus lines across Yangon. “And there are more to come,” he added. The Irrawaddy randomly asked some commuters about what they thought of the new bus service. Most of them stated that the YBS was not yet perfect but was better than Ma Hta Tha. The majority said they were delighted to see an absence of rude and aggressive conductors onboard, as before. Many of the bus lines in the YBS no longer employ conductors, but some still do. “It’s just been one year now. I hope the YBS will get better and better soon by fixing mistakes. I hope that they want to do so,” said U Soe Win, a YBS passenger. Despite the optimism, the YBS’s operation has not been without its faults. A bus accident in July killed 11 people and a YBS bus prompted a series of accidents involving 11 cars in front of the Yangon government offices in November. Complaints about unruly drivers and an absence of buses late in the evening still persist. 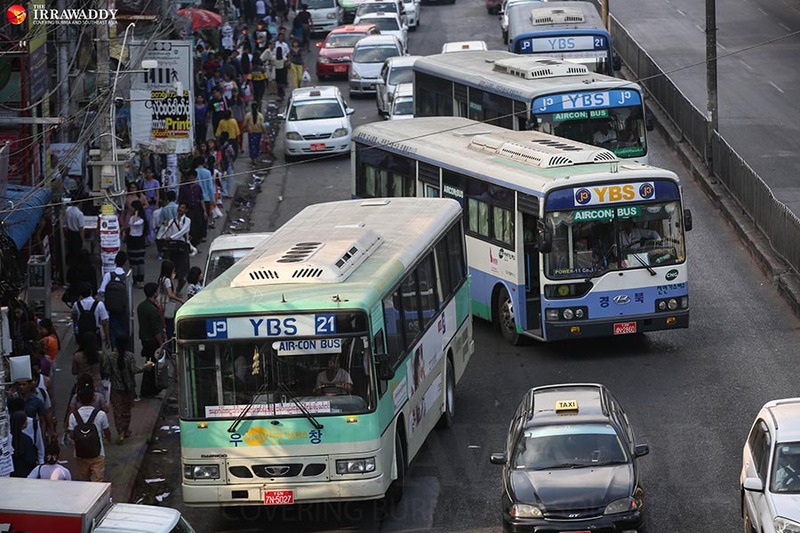 An internal YBS document viewed by The Irrawaddy reveals that as of late December fewer than half of the more than 5,400 buses operating on nearly all of the YBS’s 96 lines had operational licenses, making it difficult to impose discipline on the operators, and to follow up if a driver caused an accident. In addition, the authority has lost millions of kyat in unpaid revenue. More than 3,500 buses have yet to officially register, a problem the bus operators blame on government red tape for causing delays in issuing the required licenses for their buses, as it takes several months to get the document. “Most of the operators don’t worry about getting the license,” said one of the operators who spoke on condition of anonymity due to the sensitivity of the issue. “Some operators imported new buses with the help of car dealers to run on their lines. They rarely register those vehicles with the government,” he added. As a result, the number of buses now operating on YBS lines exceeds the system’s actual needs, contributing to traffic congestion across the city. Furthermore, the swollen number of buses affects the daily revenue of operators as more buses compete for passengers. The buses without operational licenses also cause problems for the YRTA as well, according to a member of the YBS disciplinary committee. He said all buses registered with the YRTA have to officially pay the authority 4,000 kyats per day as a management fee. “For the buses that don’t have operational licenses [those not registered with the YRTA], they are somewhat exempt from the fee,” he explained, meaning that the YRTA is losing more than 14 million kyats(over US$ 10,000) a day in earnings while being exposed to possible corruption at the management level of the bus lines. Of the more than 5,400 drivers, only a few more than 2,000 are qualified to drive commercial vehicles, including buses. The rest are ‘B’ license holders who are eligible to drive private vehicles with a capacity of less than 3 tons, according to a YBS disciplinary committee member. Myanmar’s Motor Vehicle Law requires anyone who drives buses to have an E license. The YRTA provides two weeks of training to those who have B licenses to upgrade their skills to ensure they are fit to drive city buses but fewer than 500 candidates joined the course last year. “It’s dangerous for passengers as driving a bus is not the same as driving a private car,” the source said. Worse, if any accident happens, the insurance will not cover the bus, the victims or the passengers if the driver has only a B license even though most of the YBS buses are insured, he added. One of the operators confirmed that 60 to 70 percent of the drivers in the service are B license holders. “Yes, it’s against the law. But you also need to take the demand for drivers into consideration,” he said. Sources from the YRTA and the YBS said the lack of regulation of the Yangon Region Transport Authority put the two in disarray. Currently, the YRTA is led by Chief Minister U Phyo Min Thein and the YBS is under its authority. Yangon’s Electricity, Industry and Transport Minister Daw Nilar Kyaw told the Yangon Parliament in April last year that the government was drafting a new regulatory law. Since then, there have not been updates on the draft. According to a senior official, the draft was rarely discussed at YRTA meetings. “There should be a proper structure legally endorsed regarding who will take which responsibilities. What we are facing now is that people don’t know clearly who should do what and how,” said the source. Despite JICA and Asia Development Bank’s offers to help draft the law, the sources agreed that it has to be compatible with Myanmar and invite public consultations. For this story, The Irrawaddy talked to bus operators, YBS disciplinary committee members and others close to the YBS and YRTA. They requested anonymity as the YRTA imposed restrictions on operators in December not to talk to the media or write on their Facebook accounts about the YBS meetings they attended. A bus operator was forced to sign a pledge because of his outspokenness and media friendliness. Despite an official from YRTA being appointed as media spokesperson for the YBS in the past, he has not been available for months. Dr. Maung Aung, the secretary of the YRTA, refused to take The Irrawaddy’s questions last week. U Saw Bo Bo, the YBS CEO, was not available for comments as well. YRTA Secretary Dr. Maung Aung told The Irrawaddy in October 2016 that the body expected to ease traffic congestion by 40 percent through an improved bus network and a new computerized traffic control system by November 2016. But the Traffic Control Center in Yangon’s People’s Park did not even function until now. Drivers in Yangon still have to rely on old traffic lights instead of the new ones installed by the Traffic Control Center because they don’t work properly. Sources said traffic number counts made by the center’s CCTV cameras were wrong 50 percent of the time. They said a Chinese company hired by the government didn’t hand over the technology, as it didn’t receive a full payment. Currently, a new brick building designed for the Traffic Control Center is now deserted most of the time.